I have basically been making it my life's work, as of late, to get everyone in my family to make the switch to clean, green, natural and non-toxic beauty and skincare products. Obviously, proper nutrition is still #1 when it comes to maintaining a healthy complexion and overall wellness, but what you put on your skin can be just as important as what you are putting into your body. Our skin is our largest organ, and whatever you are putting on it (i.e. creams, serums, foundation, etc.) is being absorbed into your bloodstream. 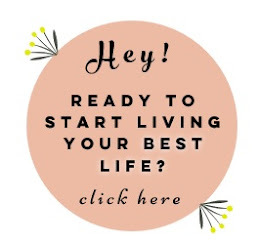 So... we are eating a well-balanced, nutrient-dense diet, exercising regularly, self-caring and detoxing like crazy... and then slathering toxic products on our skin everyday?? It just doesn't make sense. Now, I know that replacing your "tried & trues" can be scary and searching for new "holy grails" can be daunting. Then there is the question I'm sure many of you are asking, "do natural beauty and skincare products really work??" The answer is yes, and I am here to share some of my current favorites, and to convince you to come over to the green side. Next, I always check the ingredients of my products on the EWG Skin Deep website or Healthy Living App. 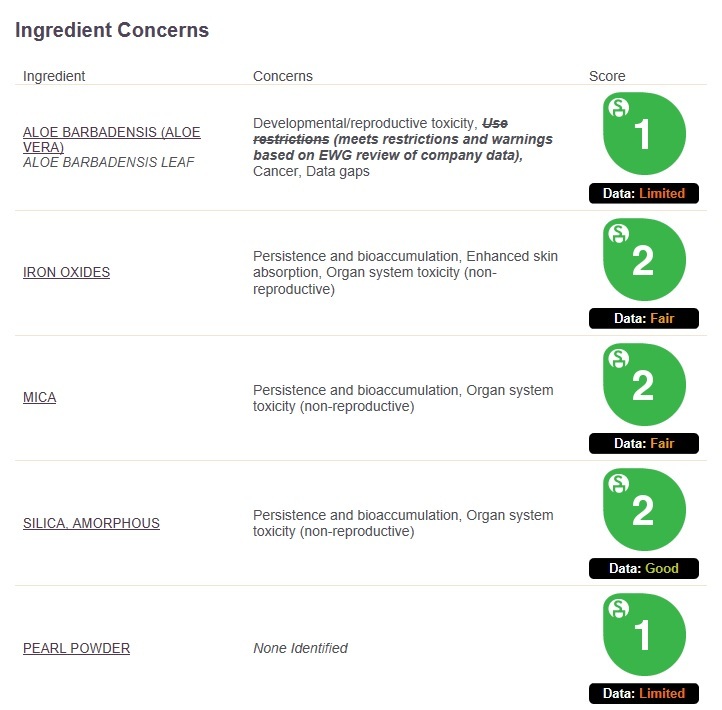 The rating system lists the ingredients of a product and scores them on a toxicity scale of 0-10 (the lower the number, the better) ThinkDirty App is another good source to check your products. These sources break down the ingredient concerns and rate them from low to moderate to high. I always look for products with an overall score of 3 or less. Below is an example of one of my current faves. 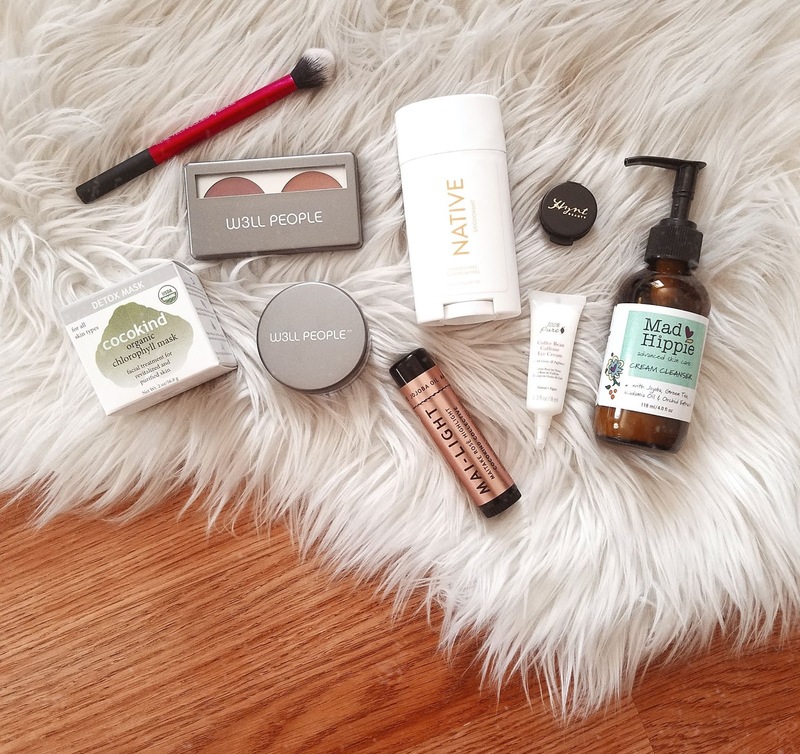 W3ll People is an amazing green beauty brand with a fair price point (you can even find them at Target!). AND they are verified by the EWG, which means their products have reached their "strictest standards for your health". 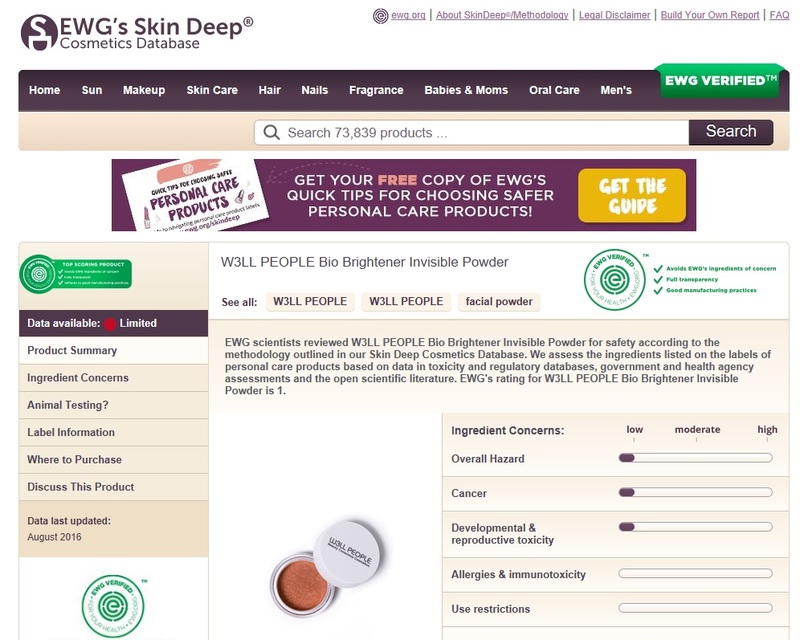 W3ll People Bio Brightener Invisible Powder ($21.99) EWG Verified! - My BFF turned me on to this stuff (she's a hair and makeup artist) and it is AMAZING. I've never really been much of a powder girl before trying this stuff and now I'm hooked! It's the softest powder everrr. I have dry skin, and this is the only powder I have ever been able to successfully use to set my undereye concealer, without accentuating any fine lines. I also use it on my t-zone where I tend to get a bit oily throughout the day. It has a very subtle iridescence to it that brightens you up without looking sparkly. W3ll People Nudist Multi-Use Color Duo ($24.99) EWG Verified! - I love me some multi-use products. Cream blush is my absolute favorite for that dewy, youthful flush. The color pay-off is also amazing. They are super blend-able and just sink into your skin. I love that the colors can be used alone or together and can double as lip and eye color too! Cocokind Skincare Organic Chlorophyll Mask ($19) - First of all... the ingredient list!! Only 4 ingredients that are basically food-grade (meaning you could probably eat it). Second... it's so good. My skin LOVES this mask. It's sort of like a clay mask (powder form, and you add water), but it doesn't harden and crack like a clay mask. It dries down nicely, is easy to remove with water and leaves your skin feeling purified, but not dry and tight. It smells really good and I feel like I'm feeding my skin wonderful things every time I use it. Cocokind Skincare Mai-Light Maitake Rose Highlight ($12) - Anything Rose Gold... you've got my attention. This is my favorite highlighter to date! The color is on point, adds a subtle, natural-looking glow, AND it's packed with skin-loving ingredients including mango seed butter and maitake mushroom powder. It's gorgeous. I love it. Native Deodorant ($12) Rated 1 by EWG - Holy moly, these deo's smell so good AND they work! If I'm having a particularly active day, sometimes I re-apply... but that is NBD to me, especially considering the fact that they are non-toxic and rated 1 by EWG. My current favorite scent is Apricot & White Peach (heavenly. not even an exaggeration). It's a seasonal scent, so it isn't available at the moment, however Coconut Vanilla, Cucumber Mint and Lavender Rose are available year round. If you aren't into scents, they also have an unscented version! They also have "guy" scents which also smell amazing. Hynt Beauty DUET Perfecting Concealer ($24) Rated 2 by EWG - First impression: wow. This concealer is definitely a "holy grail" product for me. I am always on the hunt for the "perfect undereye concealer" so this is a big deal to me. It is creamy, slightly dewy and perfect for the under-eye area. I've been really impressed with how well it covers up the darkness under my eyes (my main beauty concern). It is light, but buildable and it stays in place. Very minimal creasing if any on most days. A little goes a very long way, which is also really impressive. I ordered a sample size (I love this company for offering sample sizes), and I've been using it for around a month (!) and I even use it to even out my skin on other areas of my face!(!!) I will definitely be ordering the full-size. Mad Hippie Cream Cleanser ($15.99) Rated 1 by EWG - I've talked about this cleanser and this amazing skincare brand before in this post, and I continue to be amazed by it. This cleanser is so good. It gently, but effectively removes makeup, leaving my skin feeling soft and not stripped of its natural oils. I even rub the cleanser directly onto my eyes to remove mascara and it doesn't sting! The price really can't be beat for the quality and effectiveness. It even comes in a glass pump bottle! I love it, and expect to be singing its praises for many moons to come. So there you have it! 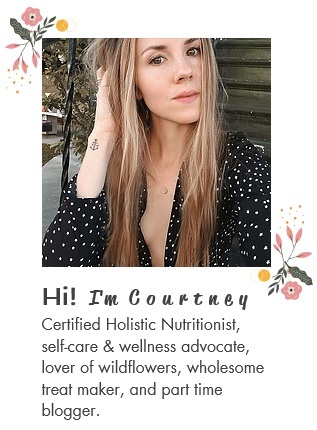 My current favorite Green Beauty obsessions! What do you think? Are you interested in trying any of these products, or making the transition into clean, green and non-toxic beauty?